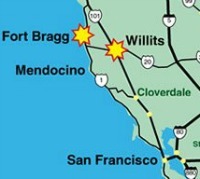 On the way south, we spent a couple of nights in Fort Bragg on the northern California coast. In addition to admiring the bird pictured in the post below, we took time to visit with Mark Ruedrich and Doug Moody. They are the president and senior vice president of the North Coast Brewery, the biggestand by far the hippestemployer in that Mendocino County town, population 7,200. Among his other achievements, Brewmaster Ruedrich developed a Belgian ale inspired by a pianist (pictured) known to Rifftides readers. This page of the North Coast Brewery website contains a half-hour film that traces the history of Monk’s namesake ale. The mini-documentary, prominently featuring Thelonious’s son T.J. Monk, also outlines the history and processes of craft beer making in the United States. I always wondered what happens to those spent hops. 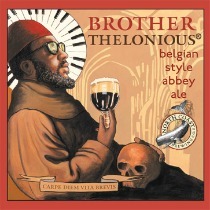 Doug, I recently purchased a 4-pack of “Brother Thelonious” and its great. Anyone who enjoys Belgian ale will be impressed. Plus, it is an added benefit to be able to support a business that does so much to support jazz. By the way, you should encourage the owners of North Coast Brewery to make other beers honoring jazz greats. Perhaps a “Prince of Darkness Milk Stout” in honor of Miles Davis. I think it would be a hit. You needn’t know where the spirit of the music will hit you or when you get religion. A brewery in Northern California…hallelujah I love it so. Brother Thelonious looks upon you with his knowing smile. Thank you Doug ! Don’t go again to Fort Bragg without us! Thanks to Hop Leaf, a great family run Belgian pub that was crawling distance from my home in Chicago, I developed a great fondness for both Belgian food and Belgian ales. After moving to Santa Cruz, I first encountered Brother Thelonious at the Monterey festival about five years ago, where it was served on draft. All the Belgians have one thing in common — rich taste, and all distinctively different from each other. Brother Thelonious fits that perfectly. For the last 2-3 years, the ale has been available at our local Costco, and there’s always a bottle or two in my fridge. You don’t have to be a jazz fan to dig it.